Happy New Year! We wish you good health and happiness in 2017! Prime Minister Justin Trudeau attended the announcement of a $20 million donation by the Larry and Judy Tanenbaum family at The Neuro on December 16, 2016. This transformative gift will help to establish the Tanenbaum Open Science Institute, a bold initiative that will facilitate the sharing of neuroscience findings worldwide. 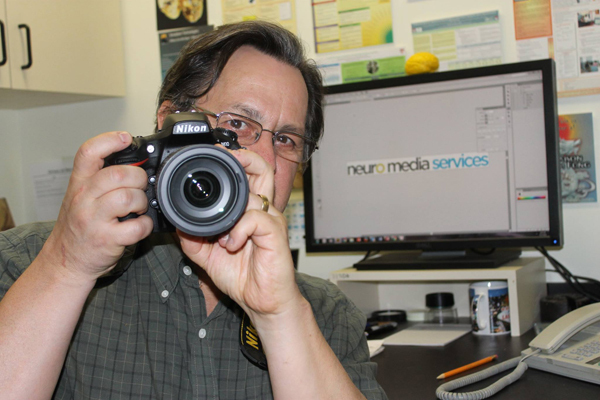 Read more about this exciting initiative, view articles in the press, or watch a CTV interview with Neuro Director Guy Rouleau. 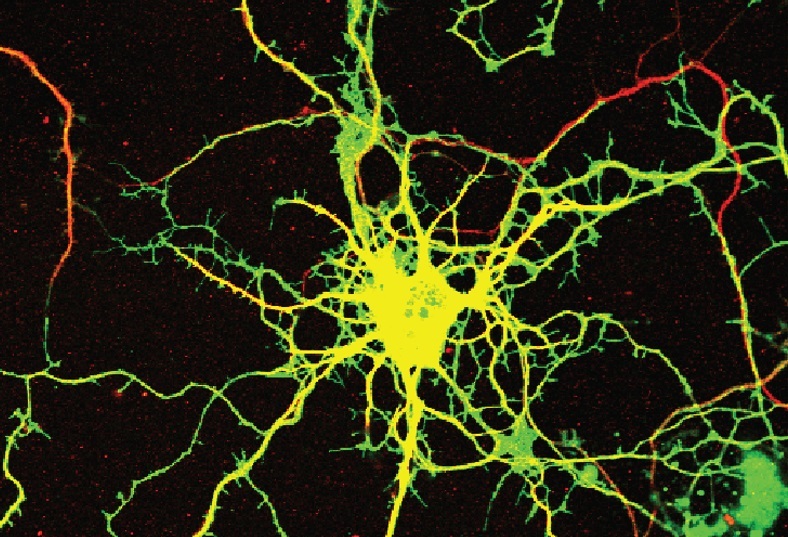 Québec Science magazine selected its top-10 Discoveries of 2016, and one of them, Rewiring an Artificial Neuron, a collaborative effort of labs in the McGill Neuroengineering Program, who created new functional connections between neurons for the first time. The findings were reported on in the Journal of Neuroscience. Learn more and read about the discovery! 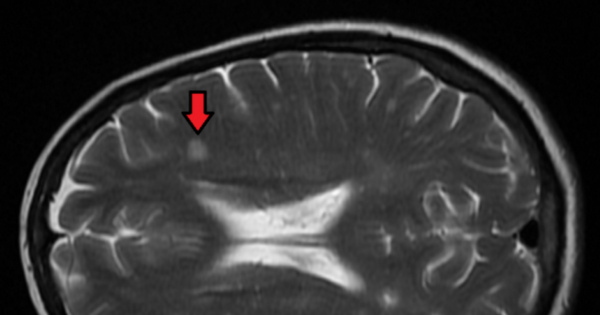 Three studies conducted by an international team of researchers, which included Amit Bar-Or and Douglas Arnold from The Neuro, have discovered that Ocrelizumab can significantly reduce new attacks in patients with relapsing MS, as well as slow the progression of symptoms caused by primary progressive MS. The studies were published in the New England Journal of Medicine in December 2016. Dr. Arnold confirms that Ocrelizumab has been tested on thousands of patients, and so far has not caused any significant side effects. The drug is now before Health Canada for regulatory approval. 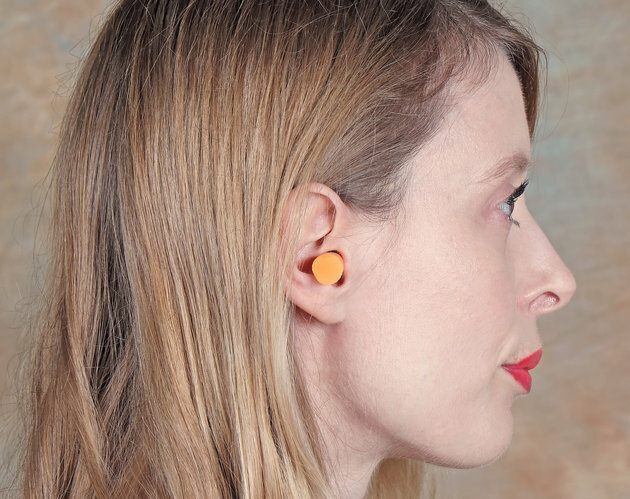 Read more or watch a CTV news clip to learn about this breakthrough! Canada has become the 17th country to join an international research partnership that is working to determine why some people develop Amyotrophic Lateral Sclerosis (ALS) while others do not, with numerous Canadian ALS researchers stepping up in a cross-country collaboration that is among the first of its kind in the country. The ALS Society of Canada (ALS Canada), in partnership with provincial ALS Societies across the country, is spearheading efforts for the Canadian component of Project MinE, a multi-national initiative that gained momentum following the Ice Bucket Challenge. Project MinE will map the full DNA profiles of 15,000 people with ALS and 7,500 control subjects, establishing a global resource of human data that will enable scientists worldwide to better target the disease by understanding the genetic signature that leads someone to develop ALS. 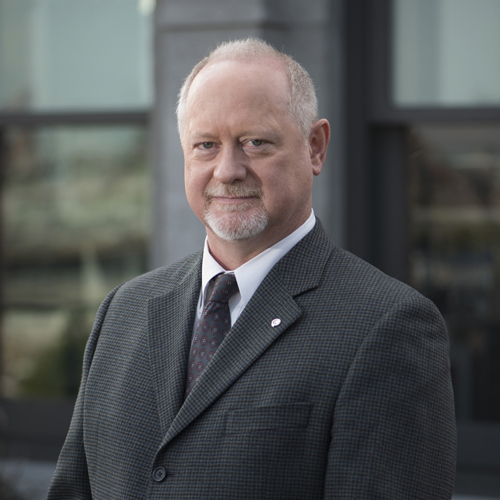 Research expertise for Canada's Project MinE effort is being provided by four of the country's leading ALS geneticists in Québec City, Vancouver, Toronto and Montréal, including Director of The Neuro, Dr. 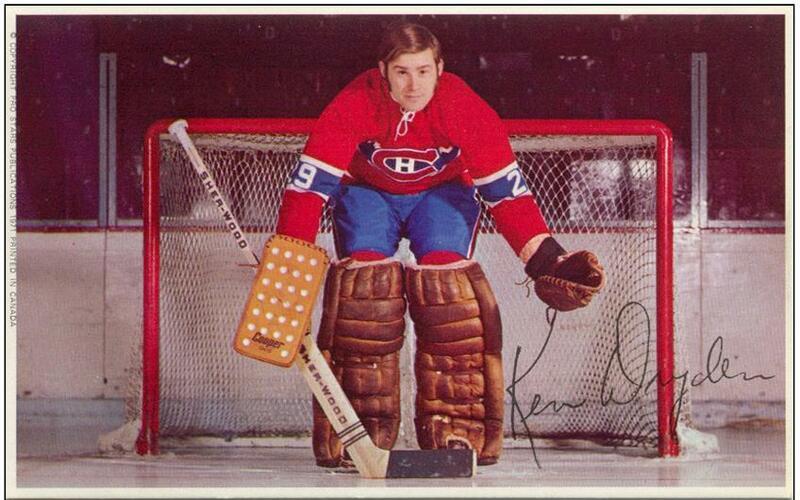 Guy Rouleau. Scientists from The Neuro and other collaborators, have discovered a genetic mutational cause for a severe form of epileptic encephalopathy. Epileptic encephalopathy is a rare but devastating sub-form of epilepsy that results in severe mental and physical disabilities in children from birth. 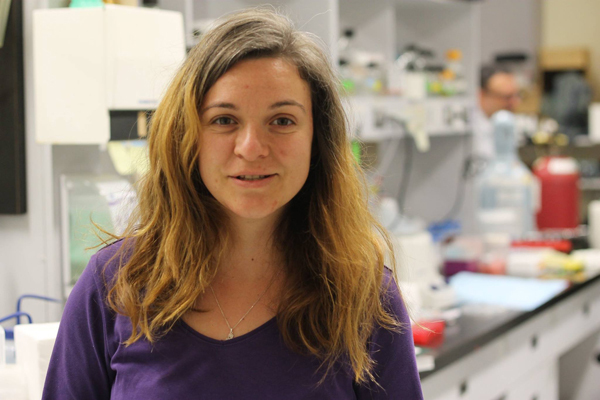 Findings improve our understanding of neuronal development and strengthens the argument that protein trafficking processes in cells are critical for normal neuronal development and function. Learn more about this discovery! 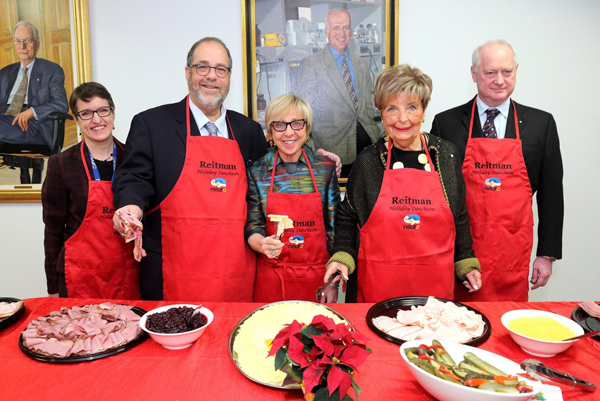 On December 9, 2016, Joel, Jill and Dorothy Reitman greeted and helped volunteer staff served a festive lunch to more than 1,200 Neuro community members. It was the 69th of this tradition, which began in 1947, the year that Ruth Reitman underwent surgery performed by neurosurgeon Dr. William Cone. As an expression of gratitude, Mrs. Reitman held a holiday party for Dr. Cone and his residents and nurses. Guests also had the opportunity to hear the The Neuro’s Cosgrove Choir led by Dr. Ken Hastings. And because every good deed merits another, staff were invited to donate non-perishable food items for the NDG Food Depot. Head Over to HEADS UP on the Concussion Issue! Join us on January 27 for a Meet the Pros Cocktail and rub shoulders with current and former athletes from the Montreal Canadiens, the Montreal Alouettes, the Montreal Impact, Tennis Canada and more! An expert-led Public Lecture on Concussion will follow. Learn more about both events or watch an interview with The Neuro’s Dr. Alain Ptito and Montreal Alouettes linebacker Nicolas Boulay. 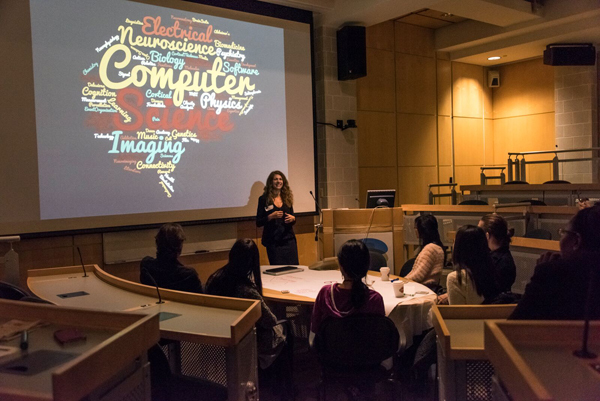 As part of McGill’s annual Innovation Week (MIW), the McGill Centre for Integrative Neuroscience, collaborated with McGill University partners, to present Thinking Outside the Brain - Innovations in Integrative Neuroscience, on November 17, 2016. This interactive workshop explored the ways in which different perspectives and diverse expertise contribute to a greater understanding of complex problems in neuroscience, including: Brain on Nature, Gender Differences, Visualization and Graphic Interpretation, AI and Machine Learning, Open Science and Big Data, and Computing and Neuroscience. On November 24, The Neuro was pleased to host a visit by representatives from Ranger Design, a Montreal-based company specializing in innovative van racking, van shelving, and storage equipment solutions. 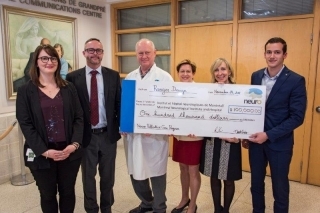 This fall, Ranger Design generously contributed $100,000 to support The Neuro and more specifically, the Neuro-Palliative Care Program, recently named for the late Susan Cameron Cook. The goal of this important initiative is to help reduce the mental and physical suffering of neurological patients and their families in the journey from the diagnosis of a terminal illness to end of life. This donation was made possible following an internal competition initiated by Ranger Design's management team, through which employees selected various organizations that the company considered supporting. Some employees included emotional pleas for Ranger Design to support The Neuro, the Neuro-Palliative Care Program was chosen as one of the primary recipients of the company’s philanthropic funding for 2016. The Neuro is deeply appreciative of Ranger Design’s vital support! Dr. Tampieri wins the prix d’excellence en innovation! 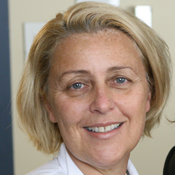 Dr. Donatella Tampieri, who won the prix d’excellence en innovation des soins de santé 2016 from the Fédération des médecins spécialistes du Québec. This prestigious prize honours exceptional medical specialists or their innovative projects, which have proven to enhance health care in reference to access, efficacy, quality or safety. Notes on The Neuro Cosgrove Choir! The Neuro Cosgrove Choir, which was named after founding Musical Director, neurologist Bert Cosgrove, was established in the mid 1970’s. Current Musical Director, The Neuro’s Dr. Kenneth Hastings, states that the choir was borne for the purpose of performing for Neuro patients. 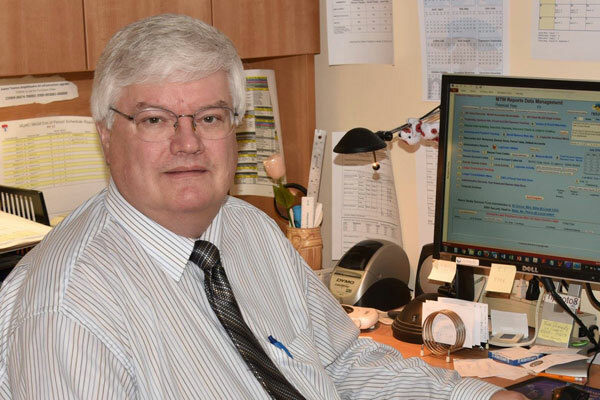 “We tour all the Neuro wards one night in December, squeezing into whatever space is available at each stop, and usually gathering a following of ambulatory patients and family visitors as we go,” explains Hastings. 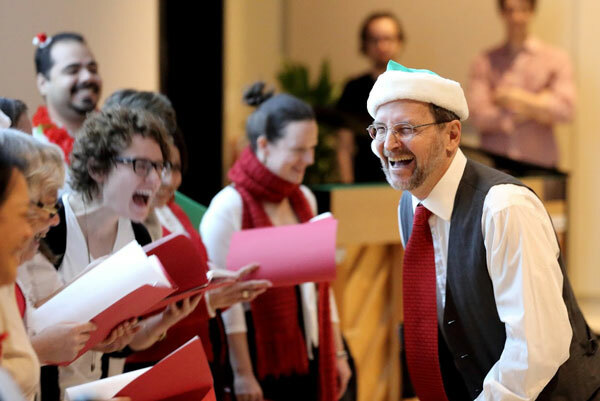 He admits that this annual tour of the patient wards is “often an emotional experience and it has become an essential element of the holiday season.” Neuro Development Officer and choir member, Bailey Levine attests, “Singing for patients at The Neuro was such fun this year! Staff working the evening shift danced in the halls with us, patients and their families followed us as we made our rounds, and it was truly a pleasure to bring some holiday cheer to those who couldn’t be home with their loved ones.” The Neuro Cosgrove Choir has also been performing at the Annual Reitman Lunch at The Neuro since the mid 1990’s. Vigilant - a DRW Company, who won the Award for Outstanding Corporation in the fewer than 250 employees category from the Association des professionnels en philanthropie - AFP section du Québec 2016 Excellence Awards. Read more or watch this related video! Wendy Sculnick, Special Events Manager at The Neuro, the entire Neuro Development team, and the A Brilliant Night 2015 Honorary and Organizing Committees, for winning GOLD in the CASE District I annual Excellence Awards in the special events category from the Council for the Advancement and Support of Education (CASE) for the A Brilliant Night Gala! 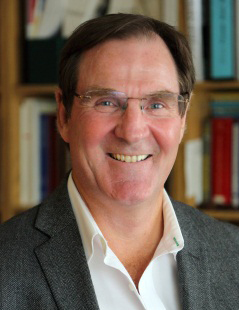 Dr. Alan Evans, who was ranked among the world’s most influential brain scientists of the modern era based on the output of a computer program that parsed the content of 2.5 million neuroscience articles, mapped all of the citations between them, and calculated a score of each author's influence on the rest. Read more! Dr. Alan Evans and a team of Neuro scientists, for their breakthrough discovery about the earliest known signs of Alzheimer's, which ranked number 12 on Discover Magazine's top 100 science stories of 2016! Learn more about the discovery! 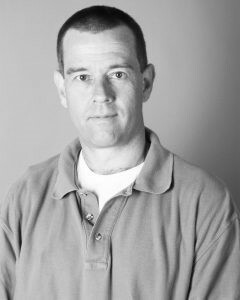 Dr. Liam Durcan, who won the Paragraphe Hugh MacLennan Prize for Fiction, given by the Quebec Writers Federation for his novel The Measure of Darkness. The novel by Neuro neurologist Durcan, is a literary thriller about an architect suffering from neglect syndrome. Read more! 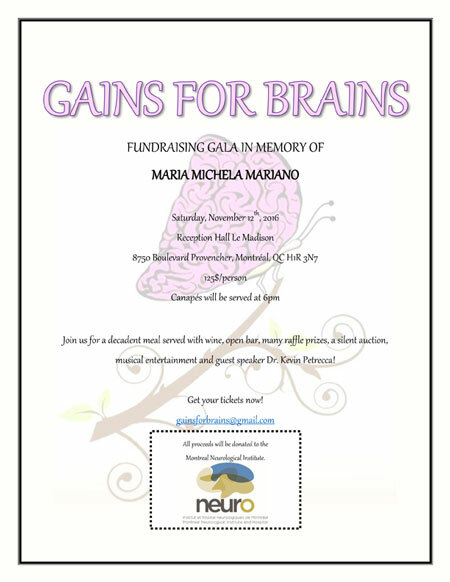 Vanessa Maggio and all the organizers of the Gains for Brains gala in memory of Maria Michela Mariano! This wonderful group of volunteers raised an incredible $25,000 to support Dr. Petrecca and the Brain Tumour Program. Dr. 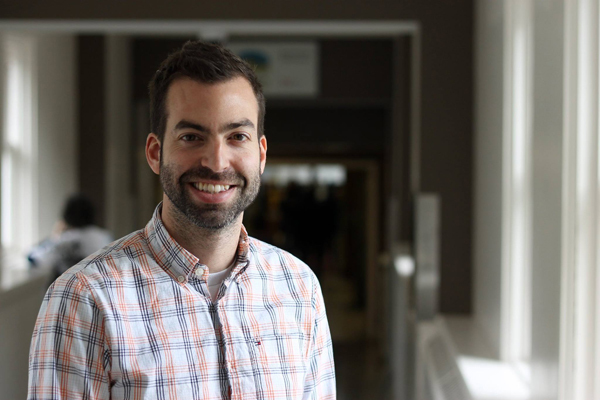 Guy Rouleau and his team, comprised of researchers from The Neuro (Patrick Dion, Edward Fon and Stefano Stifani), the Université de Montreal and Université Laval, were awarded a $2.2 million Hudson Grant to study motor neurons and astrocytes created from people living with different forms of ALS via stem cell technology. Dr. Peter McPherson is part of a national research team led by Janice Robertson of the University of Toronto which has been awarded a $1.6 million Hudson Grant to understand whether the most common genetic abnormality in ALS, which occurs in the C90RF72 gene, causes or contributes to the disease through a loss of the gene’s normal biological function. Read more! What Neuro Headlines Looked Like – 70 Years Ago! 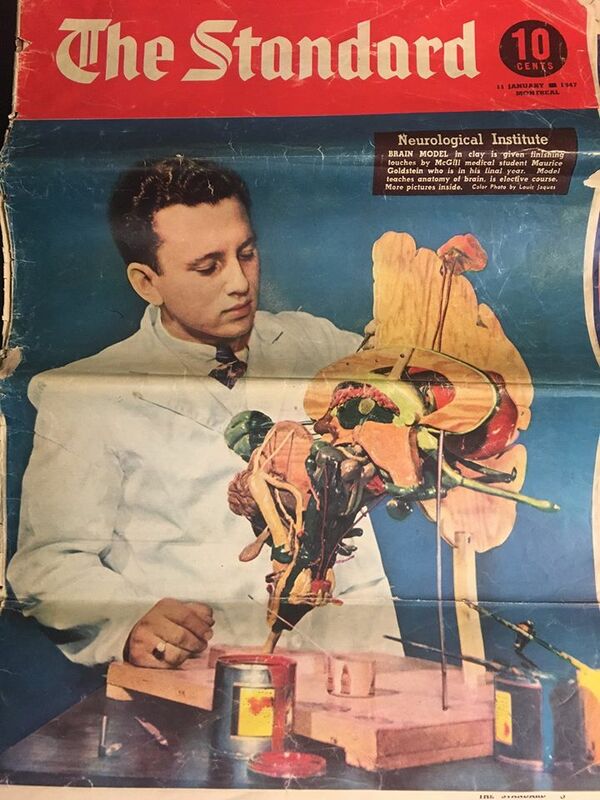 The Montreal Standard featured McGill medical student, Maurice Goldstein, showcasing a clay model of the human brain in 47. Now that’s a back track! 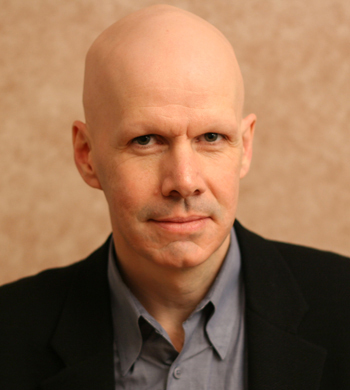 Read about Dr. Robert Zatorre's research into specific musical anhedonia, or, the inability to derive pleasure from music in the Huffington Post. Open Science is an evidence based solution to the problem of redundancy in scientific research. Watch Aled Edwards, one of the world’s experts in open science discuss the need for the increase in knowledge that open science can bring. 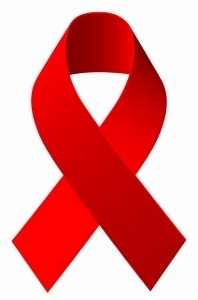 Researchers at The Neuro and the MUHC, together with a team of investigators from other universities and clinics across Canada and Australia are conducting a major study to better understand the effects of HIV infection on brain health. Learn more about this research! When neurologist William Tatum and his team stuck scalp electrodes on people undergoing video EEG monitoring for epilepsy, they stumbled upon what might be the first biological evidence that texting physically messes with the brain. 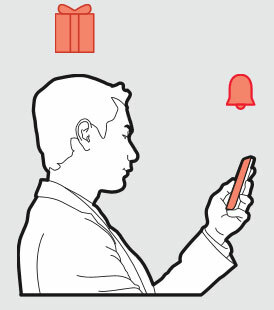 Read more about Your Brain on Texting.